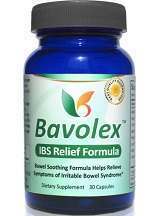 What is Bavolex IBS Relief Formula? In this review of Bavolex IBS Relief Formula, you will be presented with information regarding this product including its ingredients and the results you may expect from using it. As claimed by the manufacturer, this product is going to provide relief from symptoms associated with irritable bowel syndrome (IBS), including abdominal pain, cramping, bloating, constipation and diarrhea. Bavolex achieves this by improving the overall digestion with enzymes, regulating bowel movement and treating anxiety and stress which lead to IBS. Based on the instructions from the manufacturer, customers experiencing IBS symptoms are to take two capsules per day with meals, one in the morning and one in the evening. Those looking to maintain a healthy digestive tract should take one capsule a day with a meal, or as instructed by a health care professional. Bavolex can be purchased directly from the manufacturer’s website, for a hefty price of $47.95. This is really expensive, considering you can get up to three bottles of similar products for the same price. One would think that with such a high price, there would be some sort of a discount available, but that is not the case. Even though the manufacturer asserts that only non-toxic natural ingredients are used in the product, any individual having a medical condition or taking prescription medication should consult with a physician before taking this product. This also applies for pregnant and breastfeeding women. Customers are provided with money back guarantee which covers both unopened and opened products. It is valid for 60 days from the date of purchase. There are no reviews on the official website, but there are testimonials which seem to be quite positive. Testimonials are known to be less reliable than reviews, even when claimed to be completely real and verifiable. SmartLife Labs Bavolex IBS Relief Formula promises to provide a relief for digestive issues associated with irritable bowel syndrome. It does so by using completely natural, scientifically tested ingredients with no side effects accompanying its use. The problem is, however, a very high price and the use of testimonials instead of reviews, which is something that may deter potential customers from buying this product.